For some reason, I played quite a few computer games in 2007. Aftering buying a Wii in 2006, I got an XBox360 and PS3 to go along with it. And a few games as well. Over the next few months I’ll do a series of game reviews (and there’s likely to be a fair gap before the last few, as I haven’t finished them yet…). I’m looking at games released in Australia in 2007. I’ll also review things that come out in 2008 as I play them. Once I’ve covered them all, then I’ll announce gaming’s most prestigious prize: The Exasperated Calculator Game of the Year. I’ll try and review all of these by the end of 2008. The first real computer1 I ever used was a Commodore 64. I think it was 1984, so we were pretty much on the cutting edge. Things have moved on a lot now: my current computer has 32,000 times more RAM, and the processor is about 2000 times faster. But in a lot of ways it was the best computer I ever used. The two main things I remember are games and “programming”. I say “programming” because all it really was is typing in listings from computer magazines. Most of them consisted of about 20 lines of human readable stuff, and then hundreds and hundreds of lines of numbers. But at the end of that you had some neat program to play with. But the real thing about the C64 was the games. I’ve been playing with a few of them recently (thanks to a helpful emulator), and it’s really bought back to me how strong they were. These days games cost millions of dollars to develop, often involve Hollywood stars, and absolutely positively have to make money. Back in the 1980s you could just make something nice and weird. (See Jeff Minter‘s strange fascination with Llamas) and not have to worry too much about selling a lot of copies. But it’s not just the budgets that have changed. I realised that I play games quite differently now. Back then I’d be playing 10 games at once, jumping between them in the flash of an attention span. These days I tend to play just one game for weeks, even months on end. I think that’s mainly because the games have gotten bigger, and the spare time a little rarer, but the result is that I feel quite differently about picking up a game now. I don’t want to spend too much time on some little quirky game, because I’d rather add some huge behemoth (Civilization IV, I’m looking at you) to my play list and enjoy it. But it’s still nice to fire up the emulator and while away an afternoon jumping from game to game from time to time. 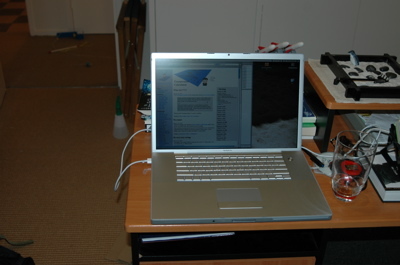 Shortly before Christmas my old Powerbook laptop started doing two distressing things. Firstly, it started getting really, really hot and was working really slowly. Secondly, and even more worryingly, the hard drive was making funny noises every time it got used. So I very quickly stopped using it, which is the other excuse that I have for not posting very much lately. But this left me without a laptop, and my desktop Mac (a G4 iMac) just isn’t up to a lot of the applications I want to run. So a new computer was in order. It’s a MacBook Pro 17″. It’s a simply lovely computer. Really fast, runs windows right next to Mac applications. Lots of memory, and a huge pretty screen. 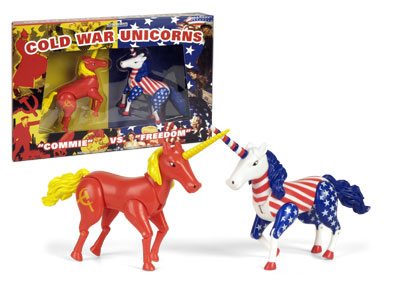 There are some very strange things in the world, but these ColdÂ War UnicornsÂ take the cake. The CHOICE 2006 Shonky Awards Ten products to make you weep in despair. 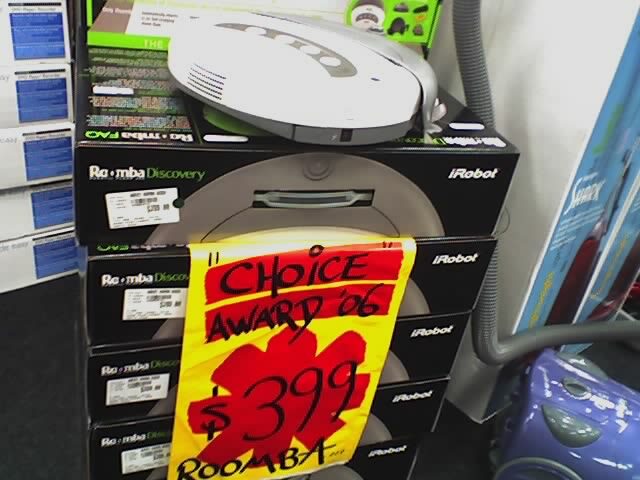 […] The CHOICE Shonky for Best Dirt Redistribution Goes to the iROBOT ROOMBA robot vacuum cleaner (CHOICE, November 2006) […] But what really made us doubt was its dirt redistribution function: when the small dirt container starts filling up, every time the iROBOT bumps into a wall or obstacle, a little heap of collected dirt falls out again. iROBOT? iDonâ€™tthinkso. Hmmm. Perhaps not quite what they suggested? (As a disclaimer, I should note that I own a Roomba, and am extremely happy with it. I’m not sure exactly where Choice got its take from. Ditto their attack on the iPod in the same article, which seemed more designed to generate press coverage than actual consumer information). No more need be said. From Think Geek.